Oh, the dreaded "double" remolino!! I took this picture of Aaron from behind in his "Little Devil" t-shirt and when I looked at it closer I noticed that you can really see those two perfect little "circles of trouble" atop his perfect little head. So Gerardo and I are prepared for the trouble we're gonna have with this one. Just like his brother, Aaron inherited the family cowlick, my two boys are so much alike. 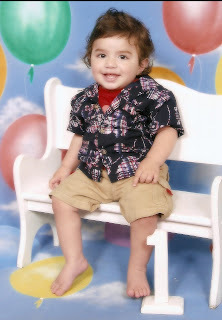 Aaron's 1st Birthday picture! It turned out really cute! He's so precious, I love this boy SO much!! I'm so happy that he's in our lives, he was the perfect little addition to our family. And I can't wait to have his birthday party and watch him eat his cake! 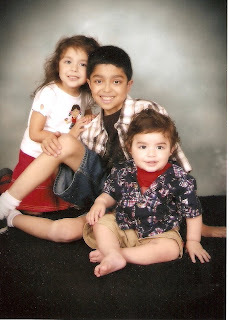 We also had a few pictures taken of all three kiddos. We haven't taken pictures of them all together. It took a lot of tries, but we got some good ones! They look so cute together. Lilly was totally concentrating on the poses that the man would put her in...it was so cute and funny. Jacob looks like such a big ol' kid, and the babies really look alike to me in these pics! They are all cute and it was fun getting them all ready and dressed for the photo shoot too. Yes the sod is finally in!! I wasn't there on the day that it was put in, so I didn't get any pictures of Gerardo, my Dad or Dad Flores putting it in. But I know that they worked VERY hard all morning putting it in just right. I took some "after" pictures, nobody was home except me and Aaron so I sat Aaron on top of the shelf of our new gazebo that Grandma & Papa bought us to take these pictures. Yes, a whole year has already gone by. Seems like just yesterday I told Gerardo that it was "time" to go to the hospital. This year has just flown by, I can't believe my baby is a year old! So many memories in this first year with Aaron; His first bath, his first tooth, his first word. Time just flew by as we watched all the many changes Aaron went through this year. He is so amazing with such a sweet personality. A little mischievous, when he does something naughty he knows it and always gives me a sly little smile. He's such a joy. So much fun. Happy Birthday my Baby Boy, We love you Aaron oh so much, You're my angel sent from up above, Have the Happiest of Birthdays My Love, My Heart! **UPDATE** The sod has been ordered & will be put in on Monday May 19th, YEAH, YEAH, YEAH!! Finally!! We are SO excited!! And....if any of you aren't busy that day...help is needed, Chelada's will be provided as payment...lol, j/k! Our local Christian Church hosted a mother/daughter tea party. It was so much fun. I loved every minute of sharing this experience with my princess Lilly. She had so much fun. They served us little miniature foods & sweets, it was so delicious. Lilly pretty much just "played" with all her food. We took pictures with everyone and listened to an inspirational speaker. It was a great tea party and I'm really glad that we participated. My daughter watches way too much t.v. She can sing along to almost every commercial she sees. She does all the moves to those hair color commercials - flipping her hair around. She dances crazy to the new IPOD commercial. She says the line "I didn't finish high school" for that community college commercial! But my favorite has to be the new $5 foot long Subway commercials...except Lilly says "$5 FOOT BALLS"!!!! So funny! F.Y.I. The song was from one of my favorite movies Pretty In Pink. I was 13 or 14 yrs old & dreamed of driving a pink VW cabriolet just like "Andie"! The soundtrack (and music like it) was pretty much the music and lyrics of my middle school and high school years. -The Psychedelic Furs, New Order, OMD, INXS, New Order & The Smiths I can remember listening to the record over and over again. When I was young there were different quotes that were my favorite in the movie, but now that I'm older I think my favorite quote comes from "Iona" (Annie Potts) when she's dancing with "Andie" in her old pink prom dress and she says....."Oh, why can't we start out old and get younger? "...love that!